Sam Mainwaring (pictured above, centre) was born in Neath, Wales on 14th December 1841. He trained as an engineer and married a Cardiff customs officer's daughter in 1868. He worked briefly in the United States for a short time before returning to London, where he worked as an engineer in Marylebone. Here the young Tom Mann was influenced by Mainwaring’s politics when he came to work there. He helped found the Labour Emancipation League, and then joined the Social Democratic Federation. He was one of those who rejected Hyndman’s politics and left in the 1885 split to help form the Socialist League. He became an active speaker for the League. He was arrested with Jack Williams in 1886, and fined £20. He was a friend of other anti-parliamentarians in the League like Joseph Lane and James Tochatti and was one of the anarchist historian Max Nettlau’s best friends. 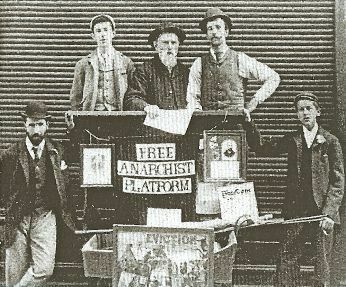 Mainwaring helped organise the League's platform at the anti-Coercion demonstration on 11th April 1887. Later in the year he and Frank Kitz went on a speaking tour in South Wales. In 1891 he returned to South Wales to help raise two children deserted by his brother Tom, Ellen and Sam, Jr, who later became a union organiser and member of the Industrial Workers of the World. Mainwaring set up the South Wales Socialist Society in this period, continuing to propagate anti-parliamentarism in the region. Mainwaring returned to London in the late 1890s and continued to advocate anarcho-syndicalism (Albert Meltzer makes the claim that Sam was the first person to coin the term ‘anarcho-syndicalism’). He published his memories of William Morris in Freedom in 1896 and 1897. He took part in anti-war agitation in London in 1900, at the time of the Boer War, speaking alongside Tom Mann, Emma Goldman and Harry Kelly. With the Spanish anarchist Tarrida del Marmol he set up the paper The General Strike in London - two issues appeared, one in September 1903 and one in March 1904. As a member of the Amalgamated Society of Engineers and the London Trades Council, Mainwaring used his experiences to denounce the union bureaucrats in a detailed fashion, referring to unofficial action crushed on Clydeside because ASE officials would not grant strike pay. The paper also gave reports of industrial action abroad and attempted to popularise French syndicalist thought, such as that practiced by the CGT, and action in a British context. Unfortunately 1904 was a year of quite bad unemployment and Mainwaring had to return to South Wales in search of work. He was “quiet, dignified bearing... full bearded, like Morris” according to Tom Mann, who added that after propagandist meetings William Morris often walked back with Mainwaring, and they looked like the skipper and the first mate of a ship. He died while addressing an open-air meeting on Parliament Hill Fields on September 29th, 1907. The 25th anniversary issue of Freedom (11th November 1911) carried a speech in which Tarrida del Marmol praised 'good old Sam Mainwaring, to whose energy we owed the few numbers of the paper the General Strike, and who... lived and died in the movement' . Sam’s nephew, Sam Mainwaring Junior continued anarchist activity in South Wales. Albert Meltzer recalls staying with him in Neath when on a speaking tour. I put quite a bit about Sam jr on Wikipedia. I am one of the few politically aware people who spoke to him left alive. Sam Mainwaring jr sought me out before 1943 and his first question was "Are you politically aware?" Satisfied with the answer he would walk about three miles on the off chance of finding an eight year old out playing in order to continue my education. Sam jr was in South Africa in 1910 organising mixed race Trade Unions. Those who did not skip out when he did served two year prison sentences. He went to California and was active with the Magon Brothers. I do not remember him mentioning the Magons, but I do remember the political principles he propounded from the IWW group he was with in California. In the 1920s he was appointed to be the South African Delegate to a Trade Union Conference in Russia. When he got there he had no proof of the identity he had used as an alias and had much difficulty attending. In 1943 in the Neath Communist Party bookshop he had Alun Thomas promise to find out what had happened to the boys he had sent to Spain. Sam jr died that year. After the War a very unhappy Peter Kerrigan spent a day with Alun in private discussion, stayed overnight and then went day visit to a beach on Gower for a bit of a break before going back home. Kerrigan was a Political Commissar in the International Brigade, and Alun had been recruiting for them. It bothers me that everything I put on Wikipedia about Sam Mainwaring jr has vanished. Crashing computer makes me nervous so I put it in two parts. Or I just forgot to put this: Jr told me Sam Sr made the term Anarcho Syndicalism rather than Anarchist Syndicalism because he wanted something acceptable to sensible working people and there was then no real evidence of a working Anarchist system. (pre 1907 when Sam sr died) It was made to indicate a direction Syndicalism should move in. It is certainly in my head that there was functioning Anarchy in factories in Barcelona, but whether Sam jr put it there or I made a later conclusion is uncertain. Do you know by any chance of any material on Sam sr.'s life? Has Sam. jr written anything about his father? I found some fragments in Tom Mann's Memoirs (where he mentions that Sam sr. was very good friends with William Morris) and then there is a scholarly article about his notion of antiparliamentarian socialism, but other than that I haven't really found much (save for this piece on libcom). Well, that sounds interesting. Can we get it? Or at least read it?